Xiaomi Philippines announces the Redmi 2, to go on sale on April 28 (Specs and Price) - Balita Boss! 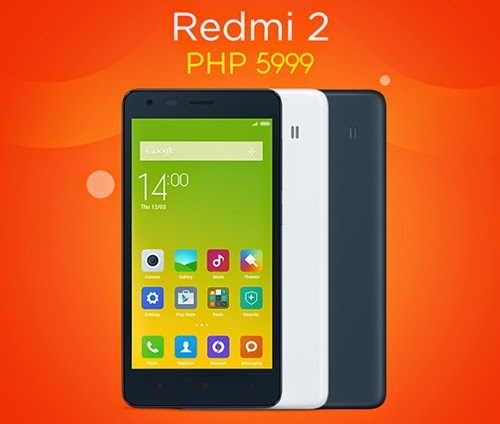 Xiaomi Philippines has announced that the Redmi 2 will be on sale on April 28, 2015. It will be exclusively available on Lazada Philippines with a ₱5,999.00 price tag. The sale will start at exactly 12 noon with 4 modes of payment: cash on delivery, credit card (Visa/Mastercard), MegaLink and Paypal. Redmi 2 smartphone equipped with upgraded 64-bit Qualcomm Snapdragon 410 quad-core 1.2GHz processor, Xiaomi’s own MIUI version of Android with 4.70-inch 720x1280 display 1GB RAM and 8-megapixel rear camera.